Product Details: Sealing length	500X 10mm Weight	120kgs Machine size	760X700X 1050mm By utilizing our years of experience, we bring forth a qualitative array of Vacuum Pack Machine with Table Top for our valuable clients. 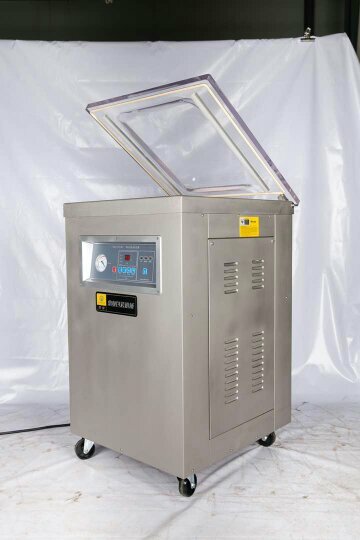 Floor type single chamber vacuum packaging machine vacuum sealer is ideal solution for food vacuum packages,like meat, vegetables,bean,rice,etc. It remove the air from the package at the same time sealing it, delivering the ultimate in protection while extending the distribution life and maintaining product integrity. Vacuum sealer characteristics: 1. Hygeian and easy-cleaning vacuum chamber. 2. Hard-wearing lid hinge ensures long service life. 3. High quality vacuum pump enables the machine producing qualified vacuum packages. 4. Integrative operating panel makes the operation and maintenance easy. 5. Transparent lid allows the operator monitoring the packaging process conveniently. 6. Micro-processor system ensures the machine processing accurately.